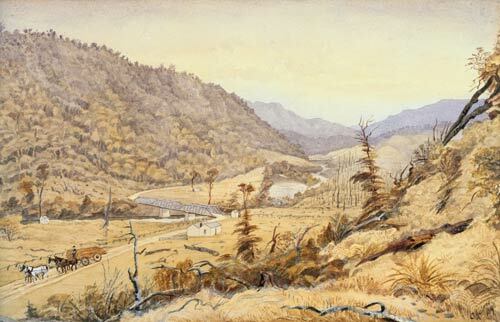 In this watercolour,a horse-drawn timber wagon travels the road at the entrance to the Akatarawa Valley, around 1890. By this stage the valley floor had been cleared of bush, but forest remained on the sides. The area continued to be milled during the 20th century, but since the 1950s, much of the bush has regenerated.